Originally located outside of Louisville, Colorado, Lazy JB Angus was founded on land purchased by John and Rose Biella and their son, Frank and his wife, Elizabeth in 1924. The brand was purchased in 1926. The belief that if you work hard enough, you can be successful kept the ranch going during the depression. Frank worked in the coal mines. And Liz milked the cows and took care of the chickens; she then sold milk, cream, eggs and butter to folks living in Louisville. They had three children, June, Donna and Richard. It was from Richard's desire to raise Angus that Lazy JB Angus came to be. 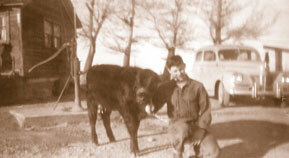 At the age of sixteen, Richard received his first Angus heifer. She was a Christmas present from his parents. "Black Diamond", named after the coal mine Frank worked in, was the foundation female of the commercial Angus herd that would eventually become a registered operation. Richard married Elaine DeSantis in 1954. They had four children, Kathi, Chris, Jenny and Richard, Jr. All the children showed cattle at the local county fair. In the 1970's, they exhibited at the Colorado State Fair, Western Regional Junior Angus Show and the National Junior Angus Show. In 1974, Kathi met Forrest Toyne from Sedgwick, Colorado. Cy Winkler, a consultant for many of the "elite" Angus herds of that time, had helped "Frosty" put together a herd of high value cattle. His cattle were sought out by cattlemen across the United States. It was an honor and a privilege to have the pick of the herd and that privilege was given to Richard and Kathi in the fall of 1974. They selected a young Emulous bred heifer that would be awarded Grand Champion of the Colorado State Fair Junior Show. Kathi's desire was just as strong as her father's and she continued to help her parents care and show their Angus cattle. In July, 1985, Kathi married Jeff Creamer, and they continued to help with the cattle operation. The family continued to grow with the birth of Brandon in 1987 and Britney in 1989. Both children would tag along to check cows, feed and livestock shows. Eventually, in 1995, Brandon selected his first heifer, Right Time Barbara, from the Forrest Toyne herd and showed her at the Colorado Junior Angus Show and Boulder County Fair. Right Time Barbara became one of the top producing females in the Lazy JB herd. She and her daughters have produced several of their high selling bulls and many champions. In 2005 Brandon received the American Angus Auxiliary's 4th place scholarship. In 2007 he was elected to the National Junior Angus Association's Board of Directors & served as Vice Chairman of the Board. Brandon graduated from Colorado State University and currently works as the 4-H Program Associate for Montrose County. He coaches the very successful Tri County Livestock Judging Team. And is actively involved in the cattle operation. At the age of 5, Britney was showing heifer calves at the state fairs. She just couldn't wait to become old enough to show at the 4-H level. In the summer of 2001 Britney, age 11, selected Lazy JB Lexus 131 for her show heifer. Lexus was later named Grand Champion Female at the 2002 American Royal ROV Angus Show and became another of the premier females in the herd. Britney followed in her brother's footsteps and was award the Auxiliary's 4th place scholarship and served as chairman of the National Junior Angus Association's Board of Directors. She won the prestigious National Showmanship Contest in 2010. Britney graduation from Oklahoma State University with a Master's Degree in International Marketing. Britney is employed with Biozyme and is actively involved in the cattle operation as well. Both she and Brandon received numerous livestock and Angus awards at the local, state and national level. Their love for Angus cattle runs deep. 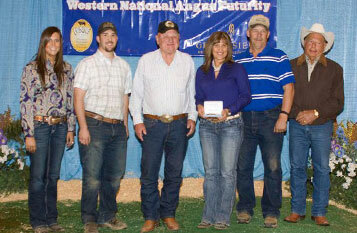 Jeff and Kathi were honored as Herdsman of the Year during the 2010 Western National Angus Futurity. The family returned to the show in 2011 and captured the Grand Champion Heifer with Lazy JB Queen Latifah 925. The Queen was a four time crown ROV winner. Lazy JB Top Shelf 9000 was named Reserve Grand Champion during the 2011 National Western Stock; he won numerous championships leading to Reserve ROV Show Bull of the Year. These two Lazy JB progeny made history during the 2010 NILE as they both captured the Grand Champion Bull and Heifer Award. Thus demonstrating the passion, knowledge and skills of this family. The operation moved to Montrose, Colorado in March of 1998. The ranch that had survived the Depression and a major highway cutting through it, could not survive with development surrounding it. The cattle were already accustomed to summering on mountain pastures, so adjusting to the new environment of the western slope Colorado was minimal. The operation continues to grow in numbers and quality just 2 miles south of Montrose. The work ethic that kept the ranch in the early 1900's continues today with each individual playing a major role in the success of Lazy JB Angus. 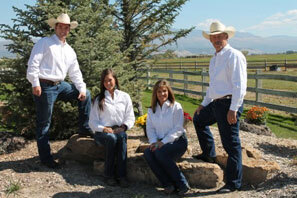 Richard, Jeff, Kathi, Brandon and Britney feed and care for the cattle, irrigate the pastures, and fit and show the cattle. Grandma Elaine keeps everyone happy by providing the family, friends and visitors with the finest Italian cooking on the western slope. It is the first hand knowledge of what the cattle carrying the Lazy JB brand can do and the desire to produce superior Angus cattle that will continue to bring customers and visitors to Lazy JB Angus. We invite you to come see firsthand our black beauties & the breathtaking scenery that surround us. Thank you from Lazy JB Angus for taking the time to view our website!